It's true, kiddies! You can have Rice Chex again! I saw on another gluten-free blog recently that Rice Chex has been reformulated to remove the diabolical malted barley and when I popped into the supermarket today, there it was in all its Gluten-Free Glory---one of Dan's well-loved breakfast cereals with the magical phrase "Gluten Free" emblazoned right on the front of the box . 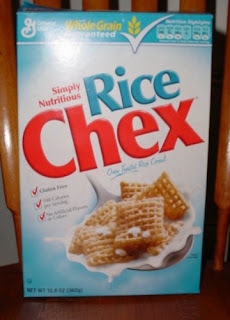 Now, last year I was canonized in Dan's pavilion for bringing home a surprise six-pack of gluten-free Redbridge after a long celiac-induced beer drought, so I was confident that I was "packing heat" today when I lugged in the groceries and showed him this lovely box of Rice Chex. Sure enough, he busted out in a wide smile and ripped open the box immediately to snack on this much-missed breakfast staple (note open package top in the photo below). I was frankly, a little jealous of this Rice Chex love-in, but after all, he was reared on the stuff and his mom always made Chex Mix at Christmas time to pass around the family. I guess I can begrudge him a little passionate time with his Chex-mistress. Gotta go. Dan's out of milk. Thanks for the tip. I blogged about them today. I'm glad Dan is able to have his beloved Chex back in his breakfast bowl. Thanks so much not only for finding this but also for posting it. I was so excited I printed a flyer for the shop for those GF'ers who don't read blogs. YEAH! GF rice chex - just as they should be.